Q: I don’t see my size listed. Do you have other sizes? We currently make skids in the sizes shown on the Order Page. 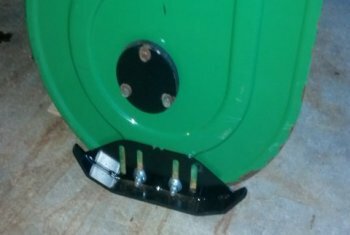 If your snowblower has a different mounting pattern than shown above, email us for details on having a set of skids custom-made to fit your snowblower. If enough people ask for a size, we’ll start producing them. 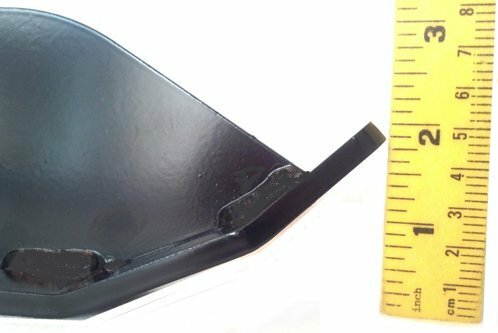 We are currently working on adding several additional sizes, so please contact us with your make and model, and the bolt mounting pattern you need. A few pictures will also be very helpful as well. Q: Do you have a chart where I could lookup what size shoes I need? Sizes vary so much that it’s much safer to measure what you actually need, then to rely on a chart. Manufacturers change specs all the time, even within a brand on the same model. We’ve even seen incorrect owners manuals. It’s really best to measure what you’ve got instead of using a chart. Q: It looks like I have a bump on the side that might cause issues with mounting. What do I do? Every auger housing is different, and there are many that have a bump that runs somewhere along the housing. The bump adds strength to the metal housing and makes it stiffer and stronger. In rare cases, the bump is close enough to the skid area that the ARMORskids® shoe touches the bump. Most of the time it’s not a problem to mount ARMORskids® right over the bump, using a slightly longer bolt to attach it. Some people have found that a bit of trimming to the corner of the skid will solve the issue completely. We now have spacers available that will move the skids outward. Q: I own a Toro or a similar brand that looks like its recessed a bit. What do I do? Check out our spacers, they are designed to move the skid further outward to take care of any recessed areas. Q: I have a long gravel driveway. The stock shoes dig in. How do Armorskids® work on gravel? Armorskids® are designed specifically to handle the challenge of gravel. Their long and wide design allows them to float over the gravel instead of digging in. They are made to handle the wear associated with gravel driveways. Sizes vary so much that it’s much safer to measure what you actually need, then to rely on a chart. Manufacturers change specs all the time, even within a brand on the same model. We’ve even seen incorrect owners manuals. It’s really best to measure what you’ve got instead of using a chart. We have one that is in a constant state of development, but to be sure, measure your snowblowers bolt spacing.